After winning toss and electing elected to bat first, Australia set 294 runs target for team India at the Holkar Stadium in Indore on 24th September. The 154-run partnership between opener Aaron Finch and skipper Steven Smith helped Australia post an impressive total of 293 for the loss of six wickets in the 50-over one-day international here. Having won his first toss of the series, Australian captain Steven Smith decided to bat first on a seemingly flat surface at the Holkar Stadium. The opening pair of Finch and David Warner took a slow start and added 70 runs to the scoreboard in 13 overs, after which Hardik Pandya sent Warner back to pavilion. Finch and Smith stood strong with individual scores of 124 and 63 respectively, thus giving the visiting team a mounting total of 294 runs to defend. 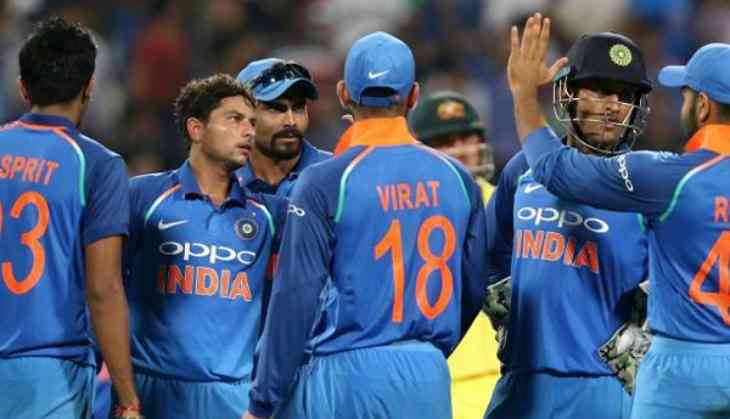 For India, pacer Jasprit Bumrah bowled an impressive 10-over spell of two wickets for 52 runs, while spinner Kuldeep Yadav bagged two wickets at the cost of 75 runs. Meanwhile, Yuzvendra Chahal and Hardik Pandya chipped in with one wicket each. Australia made two changes for this all-important ODI. Aaron?Finch and Peter Handscomb replaced Hilton Cartwright and Matthew Wade respectively. The Indian side remains unchanged.